Shoppers at the Ferry Plaza Farmers Market in San Francisco speak with farmers of Happy Quail Farms on June 25, 2011. 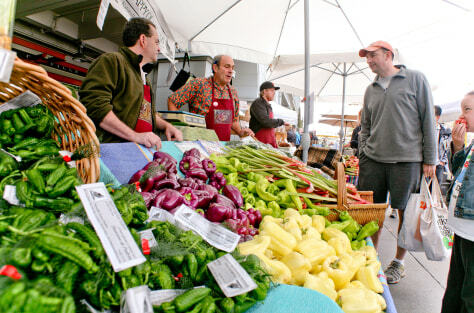 Farmers markets generally receive less federal and local oversight, but the Ferry Plaza Farmers Market is an exception. Farmers must complete an application up to 17 pages long, be screened for several months and undergo an on-site examinations by market managers.